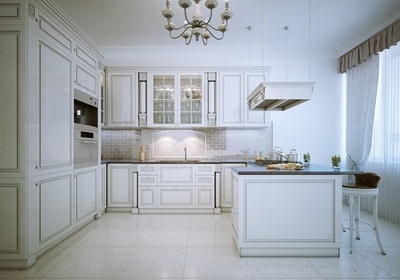 Are you planning to remodel your old kitchen? If yes, then you will surely be hunting for some great ways to make your kitchen look unique? Country kitchen could be an idea worth exploring. With their rustic charm, country kitchens are in vogue. However, like everything else if these are done wrong then they can be a disaster. This article gives you a lowdown on how to go about it in the right manner in order to make sure that your kitchen is beautiful and functional at the same time. Preliminary planning - The most important factor is the preliminary planning. This planning has to be done before the final action. Here, you are required to work on the building codes, your budget, and requirements. You need to establish what you actually expect out of your kitchen. For example, if it is an open design, then you might want to eat in your kitchen every now and then, and so you will need to have adequate sitting space . Similarly, if you do a lot of baking, your country kitchen needs to have enough space for all the baking equipments. 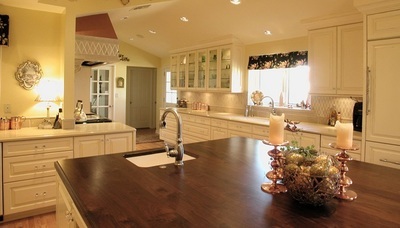 Kitchen layouts - This naturally flows from the planning part. Depending on your expectations from the kitchen, you can have an open design, a partially open design, or a close design. You will need to figure out where you keep the stove, how many cabinets and shelves do you need in the kitchen and things like these. Once you note all that down, the next thing would be to jump to the specifics of it. Kitchen zones - In this step, you will need to consider the different kitchen zones like cooking, washing, baking, storing etc. The requirements vary from person to person. However, certain rules hold for all kinds of kitchens, including country kitchens. For example, you need to ensure a flat counter space where you want to keep your oven. Similarly, for the washing area, you will need to get the main sink installed near the dishwasher. If you intend to do all the chopping and cutting tasks in the kitchen, it will be ideal to have a flat counter near the fridge. Countertops - You need to make the right decision when it comes to the kitchen countertop. Country kitchens have huge space. So, you can plan to have longer counter top on both the sides of the kitchen. Make sure the height of the counter top must easily accommodate your height, as otherwise it can become a problem. You also have to choose the right material for the counter top. Granite, stainless steel, concrete, acrylic, marble, wood, tile and engineered stone are some of the materials that are commonly used for counter tops. Color and design - This can be the most interesting and confusing part of giving a country makeover to the kitchen. Choosing the right color for your kitchen and browsing through those design catalogues can certainly become a tedious task. The simplest idea is to go for an all-white theme for walls and flooring, and complement that with rustic wooden tones for cabinets. In order to infuse some color in your cooking space, you could probably have trinkets in impressive colors on open shelves. You could also go for a combination of white, black, and rustic wooden tones. However, keep in mind not to use too much black, especially if your kitchen is not too large. Black can make a space look smaller. Getting the lighting right - Most people tend to ignore this part, but it is crucial to get the ambiance right. Make sure there is a window that allows ample natural light during the day, and keeping your lighting fixtures slightly rustic in their tone to complement the overall theme. So, go for the wide array of quality choices on Country Kitchens now!